Another instalment in my 101in1001 challenge - this time it was to give Brussels sprouts another try. To say that I am not fond of Brussels sprouts is putting it lightly. I don't like the taste, I don't like the texture; in short - I could comfortably do without ever eating Brussels sprouts again. But, seeing as TheHusband has quite a fondness for these little buggers, I decided to give them another go. I set about finding a recipe that promised to maximise the taste, adapted it a wee bit (by adding apples and leaving out the onion, as I had none), and this is what ensued. I can't say it was the best dish I've ever had, but they certainly weren't as bad as I've had them before. The roasting do seem to bring out the best in the Brussels sprouts. Whether I would make it again? Maybe, but it will mostly be for TheHusband's benefit! 2. Cut a cross into the bottom of each Brussels sprout. 3. 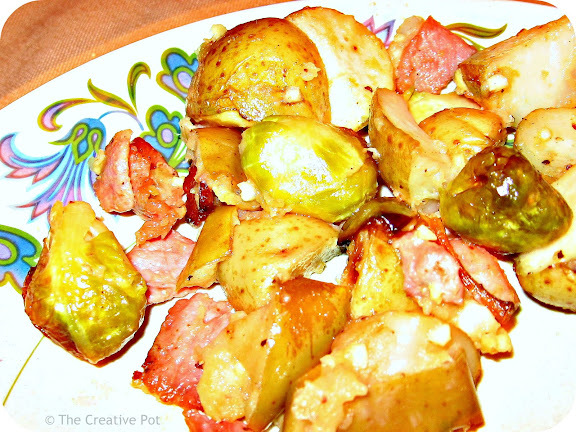 Combine the potatoes, Brussels sprouts, onions, apples and bacon in large bowl; toss with the oil. Sprinkle with the salt and pepper and toss again. 5. While still warm, toss the butter and lemon juice over, until the butter has melted and all the veggies are well coated. Serve immediately.